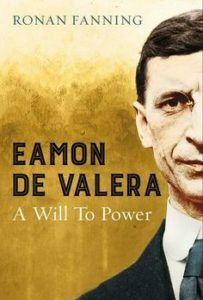 I have just finished reading the late Ronan Fanning’s “Eamon de Valera, a Will to Power”, aided in part by an enforced day long sojourn in Dublin airport, when my flight to Brussels was grounded by Storm Doris. De Valera has been the subject of many biographies, but this is the only one I have read. I met him once, shortly after I became a Parliamentary Secretary in Liam Cosgrave’s government, in 1973. He was totally blind at the time, but he knew who I was, and was encouraging to me in my commitment to political life, even though we were not of the same party. Ronan Fanning’s book is very well written. It seems to me that it captures the essence of de Valera , without getting into excessive details about any of the transactions of his career. As is well known he was born in America to a Limerick girl,Kate Coll, who became separated from her Spanish husband, Vivion de Valera, early in their marriage. She had to work to live and this was not compatible with caring for her small two and a half year old son, who was sent to Ireland to be looked after by his grandmother and uncles. They were a farm labouring family and life was hard. But Eamon was a bright student, and made a huge effort, and had to to overcome his uncle’s objections, to get to school in the Christian Brothers in Charleville, with the aim of winning a scholarship to a boarding secondary school. He won one, to Blackrock College in Dublin, at the age of 14. Blackrock College seems to have become a second home to him, and the priests in the college took the place of his absent parents. Thanks to Blackrock, he retained a love of rugby to the end of his life, preferring it to Gaelic football, a fact he did not advertise in nationalist circles. Ronan Fanning believes de Valera first became the leader of Irish republicans when a prisoner in 1917 after the 1916 Rebellion. His leadership style was not collegial. He listened but made the big decisions alone. This was a big problem with the Treaty negotiations of 1921. Because de Valera did not go to London himself, the Treaty was not HIS decision, and he was unhappy with any decisions that he himself had not taken. His failure to lead properly on this matter contributed to the Civil War and to his own temporary political demise. When he came to power in 1932, building on the work of his predecessors, he set about removing the remaining limitations in the Treaty. These were mostly symbolic, apart from the return of the Treaty ports in 1938. If the Royal Navy still had those ports in 1939, Ireland would probably not have had the luxury of neutrality in the Second World War. He was politically clever in setting the objectives for his party….the ending of partition and the restoration of the Irish language. Both objectives stirred nationalistic emotions, and this were helpful in mobilising support at election time. But both were also practically unachievable, and thus could be re used, election after election. De Valera had no interest in economics. This explains why he started a ruinous trade war with Britain over annuities, that were properly owing to Britain, for land purchase. De Valera was prepared to sacrifice the livelihoods of those engaged in Ireland’s largest industry for a point of nationalistic principle. Something similar is happening today, only now it is the British who trying to harness the nationalist horse for party political gain, without regard for the economic consequences for trade between our two neighbouring islands. The opening up of the Irish economy in the 1950’s began while de Valera still led his party. Fanning credits this to his then Finance Minister Dr Jim Ryan, as much as to Sean Lemass. The contribution of Ryan’s predecessor, Gerard Sweetman is not mentioned. WHAT IS THE ALTERNATIVE TO A HARD BREXIT?